When Rohingya Muslims fled persecution and slaughter in Burma in past decades, tens of thousands found refuge in Saudi Arabia, home to Islam’s holiest sites. This time around, Muslim leaders from the Persian Gulf to Pakistan have offered little more than condemnation and urgently needed humanitarian aid. The lack of a stronger response by Muslim-majority countries partly comes down to their lucrative business interests in South East Asia, experts say. Much of the Middle East is also buckling under its own refugee crisis sparked by years of upheaval in Syria, Iraq, Yemen and Afghanistan. Saudi Arabia is already home to around a quarter-million Burmese people who took refuge in the kingdom under the late King Faisal in the 1960s. The kingdom pledged $15 million in aid to the Rohingya this week. As the world’s biggest oil exporter, Saudi Arabia competes with Russia to be China’s top crude supplier. Expanding its footprint there requires Burma’s help. A recently opened pipeline running through Burma, also known as Burma, carries oil from Arab countries and the Caucuses to China’s landlocked Yunnan Province. The 771-kilometre (479-mile) pipeline starts at the Bay of Bengal in western Burma’s Rakhine state, from where most of the Rohingya have been forced out. In 2011, a subsidiary of state oil giant Saudi Aramco and PetroChina, an arm of China’s state-owned CNPC, signed a deal to supply China’s southwestern Yunnan Province with up to 200,000 barrels per day of crude oil, just under half of the pipeline’s capacity. Saudi Aramco did not immediately respond to a request for comment on shipments through the pipeline. “One could argue that Saudi Arabia is less likely to be outspoken on this (Rohingya) issue because it actually relies on the Burmese government to protect the physical security of the pipeline,” said Bo Kong, a senior associate at the Centre for Strategic and International Studies who has written about China’s global petroleum policy. The pipeline became operational in April following years of delays. It allows tankers to bypass the Strait of Malacca, cutting typical voyages by about seven days. 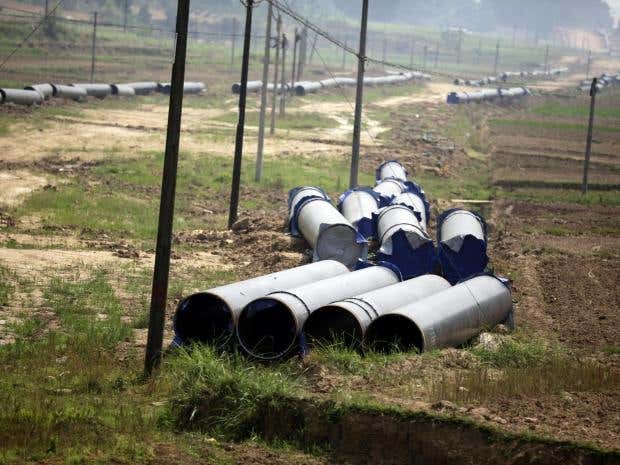 A natural gas pipeline from Burma’s Shwe gas field runs alongside it. Daniel Wagner, founder of consulting firm Country Risk Solutions, said Saudi Arabia is moving ahead with its economic and political agenda in Burma and Southeast Asia, yet can still “claim to have stood the moral high-ground” by previously taking in refugees and providing financial aid. “The important point is that natural gas and oil flows through Rakhine state,” he said. Muslim-majority countries have been increasingly promising aid as the number of refugees swells in Bangladesh. Azerbaijan, which also appears to be exporting crude to China through the pipeline, has ordered 100 tonnes of humanitarian aid to be dispatched. Turkey, which like Iran jostles with Saudi Arabia to be the Islamic world’s centre of influence, has mobilised millions of meals for refugees in Bangladesh and vowed to maintain a refugee camp there. It has also provided clothing, part of more than 150 tonnes of humanitarian aid supplied overall. Iran, Saudi Arabia’s regional rival, has sent at least 40 tonnes of aid. Iranian Supreme Leader Ayatollah Ali Khamenei recently took a swipe at other Muslim countries with business interests in Burma, urging them to ramp up pressure on the government there. Images of burnt Muslim villages in Burma and of traumatised and often barefoot Rohingya women, children and elderly crossing into Bangladesh sparked protests in several Muslim countries. A large rally was held to denounce the crisis in Indonesia, which is working to boost bilateral trade with Burma to $1 billion a year. In Pakistan’s largest city of Karachi, tens of thousands protested. Lawmaker Farhatullah Babar of the Pakistan People’s Party has pushed his government to suspend or at least slow the implementation of defence agreements worth hundreds of millions of dollars with Myanmar. He told the Associated Press that an official responded to his request by saying Pakistan is pressing Burma through diplomatic channels to stop the violence. “Pakistan should not be seen as strengthening a regime that is using weapons against its own people,” Babar said. He declined to elaborate on the details of the defence agreements. A report by IHS Jane’s in February said Burma two years ago bought 16 JF-17 Thunder aircraft, co-developed by Pakistan and China. The defence weekly said Burma is now in advanced negotiations with Pakistan for licensed production of the fighter jet’s advanced third-generation variant. The 57-nation Organisation of Islamic Cooperation held an emergency session on the sidelines of the UN General Assembly in New York this week to discuss the crisis. The organisation, headquartered in Saudi Arabia, issued a lengthy statement earlier this month expressing “grave concern” over the exodus of Rohingya. But unless its member states take tougher action on their own, there is little the OIC can do to pressure Burma’s government. Jason von Meding, a specialist in disaster response at the University of Newcastle in Australia, said religious differences are not the only reason Rohingya are being forced out.